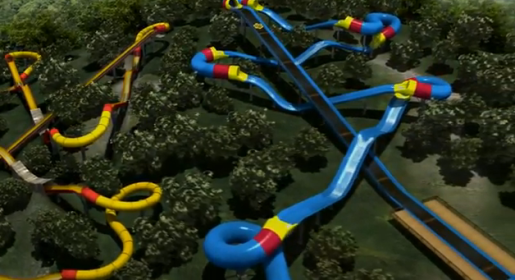 Mammoth, the world's longest water coaster, will be coming to Holiday World in 2012. While the theme parks Holiday World and Splashin’ Safari in Santa Claus, Indiana, aren’t terribly well-known yet, to coaster fans they’re fast becoming the destination of choice. Two parks for the price of one and free unlimited soft drinks at one of the cleanest theme parks I’ve ever been to is great, but the real attraction for Holiday World is its impressive collection of rides. Those rides are only getting better as Splashin’ Safari continues to expand. In fact, the Cook family’s latest addition to the park is a record-breaker. Coming May 2012, Mammoth is the world’s longest water-based coaster ride in the world. Mammoth will be the world’s longest water coaster at over 1/3rd of a mile in length. The ride features a seven-story descent over the course of its length from highest point to lowest point, starting at nearly 70 feet off the ground and descending a total of 282 feet. The ride takes up a staggering two acres of park space! Mammoth will have six-person boats. Meanwhile, the second-longest water coaster in the world, Wildebeest, is right next door to Mammoth at Holiday World, making the little theme park from Santa Claus, Indiana, one of the world’s most innovative coaster destinations for the enthusiast. Wildebeest is 64 feet high, is another 1/3rd of a mile, and features seven drops for a total of 178 feet of descent. It also reaches speeds of 36 feet per second at points; in spite of this, the Wildebeest lasts an impressive 2:30 of ride time! Wildebeest features four-person boats.